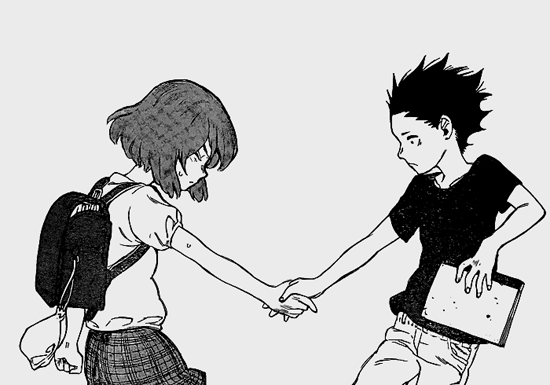 I really like this manga, Koe No Katachi, a new transfer student in the primary school. 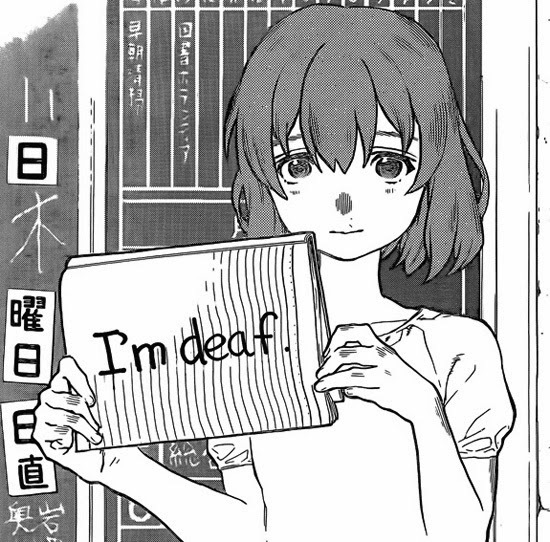 Despite the fact that Nishimiya Shouko is deaf, she enters public school with an optimistic outlook and hopes to get along with everyone despite her disability. Over time however, the class begins to pick on her because of her disability, looking down on her for what they perceive as being weird and a nuisance to everyone. There is a naugthy kid named Shouya Ishida, bullies her the most and thinks nothing of it. As the story goes, the bullying intensifies, but to explain what happens next would ruin the impact of the story’s dramatic resolution. 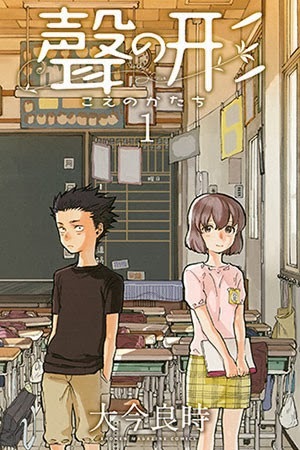 This manga explores the troubled life of a deaf elementary-school girl, the intensity of bullying in Japanese schools, and what it means to try reach a message to express her feeling to her friends. Many friends don't like Shouya Ishida or Nishimiya Shouko, they ignored by everyone, and just make fun of them. Shouya Ishida never trust or believe in his friends, since his friends always gossip bad about him so he want to commit suicide because he hates everyone around him. Other side, Nishimiya who is strong and always believe in herself to get friends, still help her friends no matter they bullied her or cannot accept her and enjoyed her life so much than Ishida. Nishimiya Shouko are nice and caring girl who still forgive Shouya Ishida so she really want be his friend but, Ishida still hate this girl, so he cannot accept her because she is Deaf. At end, they are really HATE and ANGRY each other. When they meet each other, they cannot express their feeling each other but, they still want to forgive each other after 5 years! Because they are experienced their painful childhood days, understand each other because they suffered alot and still be strong. They just leave everything in their life, but their heart still REJECT each other? They still think,"Can they become friends again or not?" What will be happen to two person who suddenly meet up so each other when they passed each other! 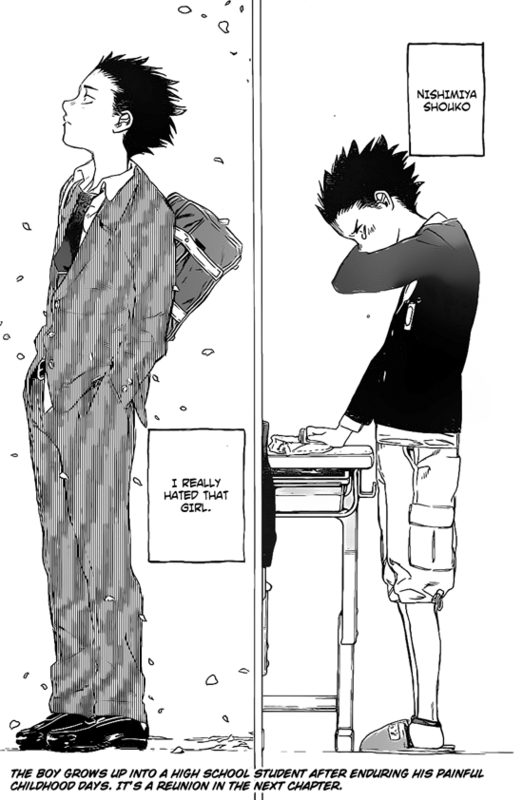 Mostly, it is about Shouya Ishida's life that we understand him so deeply...He understands what he try to change himself and cannot believe who are his friends but, he try to social with his friends. He failed and tried to kill himself on many times. He try to understand what friendship means, that is why he try to understand and accept Nishimiya Shouko so slowly. So, this manga have the messages are strong and very moving, that it keep me optimistic for society and humanity as a whole. Many Deaf readers sure really happy when they read this manga on first time! It make they remember what they do in their past so, they want to become better than the past!